Police Union Attacks Kalb and Gallo: As the Express reported last week, the Oakland Police Officers Association is spending tens of thousands of dollars to try to unseat councilmembers Dan Kalb and Noel Gallo because the two of them sponsored Measure LL, the police commission ballot measure. Several North and East Oakland residents sent us copies of the police union mailers that are saturating their neighborhoods. OPOA has spent $34,776 on the ads so far. 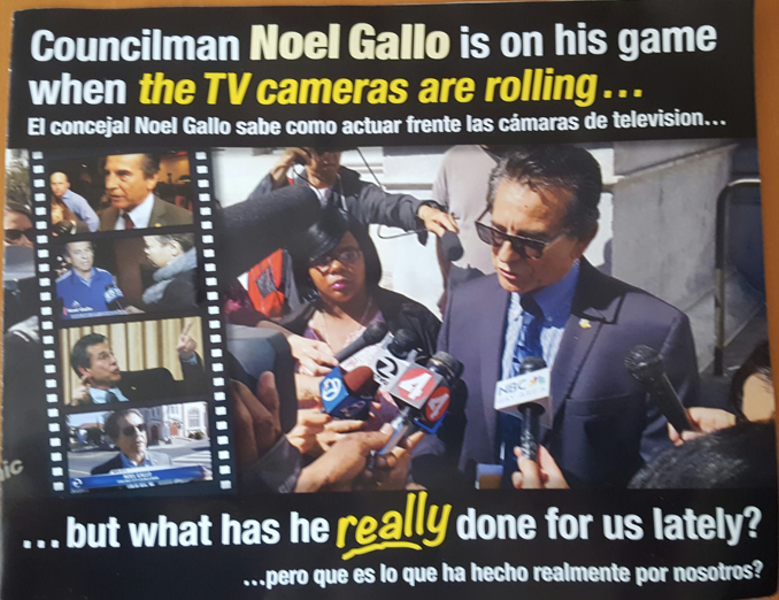 The cops call Gallo "the least effective politician in Oakland," and blame him for everything from abandoned vehicles to potholes and illegal dumping. 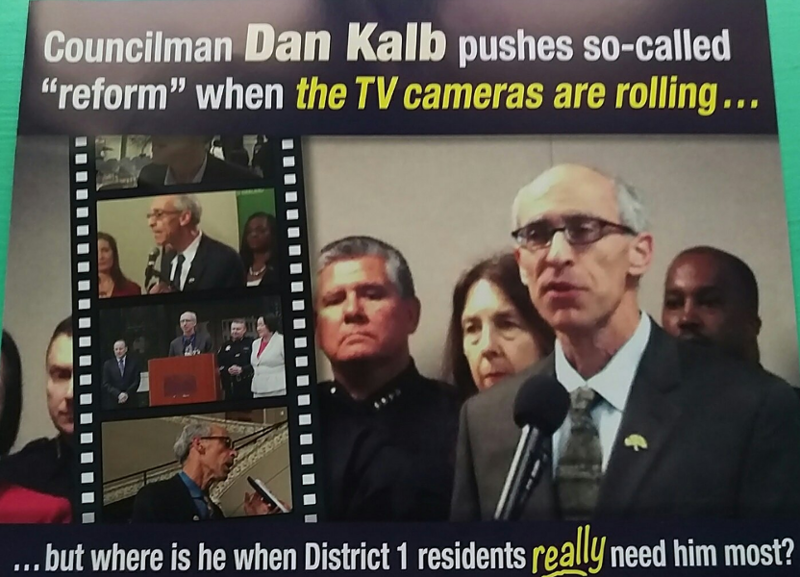 The police union describes Kalb as "the least responsive politician in Oakland," and imply that he ignores the needs of his constituents. Only about 8 percent of the Oakland Police Officers Association's members actually live in Oakland. Most Oakland cops live in the suburbs of Contra Costa County, or over the hill in towns like Walnut Creek, Pleasanton, and Livermore. OPOA didn't return emails seeking comment about the elections mailers. In addition to their independent expenditure campaign against Kalb and Gallo, the police union has also contributed to several East Bay politicians this year. OPOA gave Nancy Skinner $4,000 for her run for the state Senate District 9 seat, and the union contributed $3,400 to Rob Bonta, the incumbent 18th District assemblymember who is running for reelection. The police union also gave Noel Gallo's opponent Viola Gonzales $1,400. Garbage Contracts No Problem: Several years ago Oakland negotiated its biggest, most expensive city contracts. They were for garbage, food waste, and recycling collection and disposal. No sooner did the city sign the contracts than rates shot up for landlords and businesses. The city was widely criticized for locking in expensive, long-term franchises. The Alameda County Grand Jury conducted an investigation of the city's waste contracts this year and found that Oakland failed to create a competitive bidding environment, did not perform necessary financial analyses to understand how the contracts would harm ratepayers, and rigged the contract competition to favor the incumbent companies, Waste Management and California Waste Solutions. The Grand Jury also found that Oakland improperly engaged in closed-door negotiations with the two companies that ultimately won the contracts, and that all this resulted in Oakland residents and businesses paying higher collection rates and a higher franchise fee than surrounding communities. So how did the city respond to the Grand Jury report? Oakland's Department of Public Works claims in their official response to the Grand Jury that they in fact solicited competitive bids, and that the big rate and franchise increases were publicly discussed on multiple occasions, and furthermore that the new rates and fees are higher than other places only because they're new. To sum up Oakland's response, everything is cool, more or less.